Hereford: For our next review, Angus had a great idea. 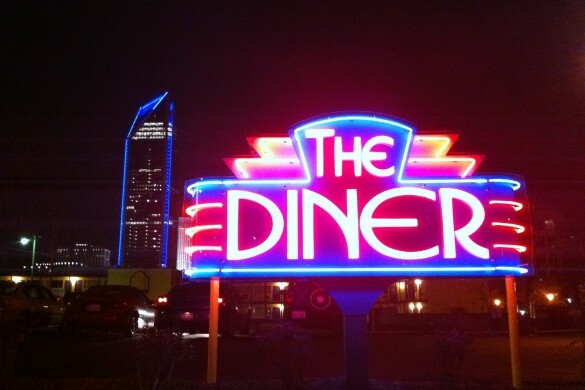 He scoured the internet to find out restaurants that had actually had won awards calling them the “Best Burger in Charlotte,” so we could visit a properly accredited place. His diligent research led him to Mueller’s, a small family place over in Myer’s Park, which had received several of those acclaims. So, we drive over there about 7:30 on a Friday night, eager to try it out. But, we arrived to find a dark parking lot. Angus’s research didn’t include finding out what time they would be open, and the sign we found when we got there told us that they’re only open for lunch. Angus: Hey, don’t blame me. They don’t list their times on their website. It’s not my fault. Hereford: You’re right, but I’m still going to blame you. Angus: So, forced to put that review off until a later date, we had to decide where we would go instead. Our friend, Matthias, who joined us, suggested we head over to Montford Drive near the Park Road shopping center. It was nearby, he said, and it would have a lot of options for us. We could look around a bit before making our decision. So that’s what we did. 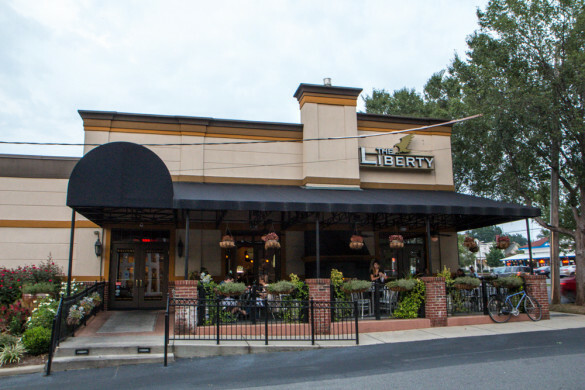 Hereford: We parked across from the bowling alley and walked up Montford, peeking in the windows of each restaurant to see what type of place they were and what they served. 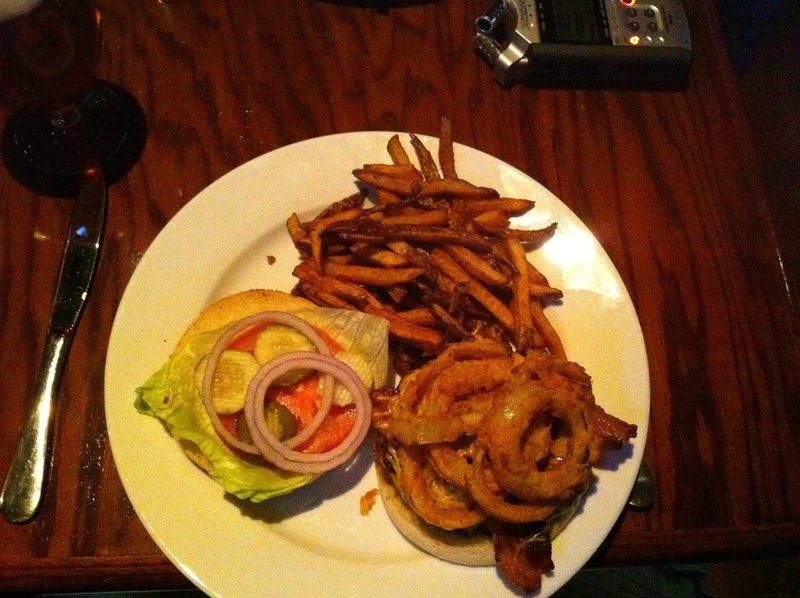 We figure there are at least five strong possibilities for burger blog reviews on that road, but ultimately we settled on Brazwell’s Premium Pub to visit that night. We chose it for one simple reason: they had their menu posted outside by the door. When we looked at it we confirmed that they had several options for burgers, and since that usually works out well for us, we went inside. Angus: Man, was it busy in there. This place looked like it is definitely a destination spot for a lot of people on weekend nights. 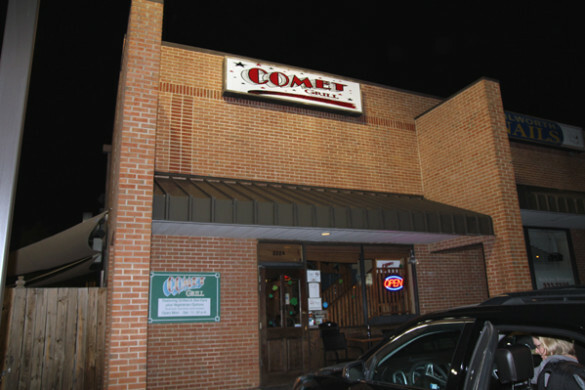 I could see why—it seemed like a fairly nice sports bar. They had a lot of TVs, and some pretty cool sports decorations on the wall. For instance, they had a shadow box on the wall filled with boxing gloves signed by Mr. T, Sylvester Stallone, Muhammed Ali, Joe Frazier, and others. We haven’t seen that before. Hereford: Sure, that’s cool, but it’s got to be fake, right? I did a quick Google search and an Ali signed glove alone seems to go for thousands of dollars. There’s no way you would put that much money into something that a lot of people probably don’t even notice. I mean, if it was real, with the money you invested in that you could have bought this. Angus: You know, if you are going to put up a set of fake signed boxing gloves, you should put in some signed by fake boxers. It would have pretty sweet if they had a glove signed by Soda Popinski or King Hippo . Hereford: And, if we’re wrong about the authenticity of the gloves, we offer our apologies. Angus: And feel free to hit me in the face with Ali’s glove for compensation. Hereford: They also had a very nice patio area, which they had somewhat enclosed for the winter so you could still enjoy it out there when it’s cold. When it’s warm, I bet it’s really nice. 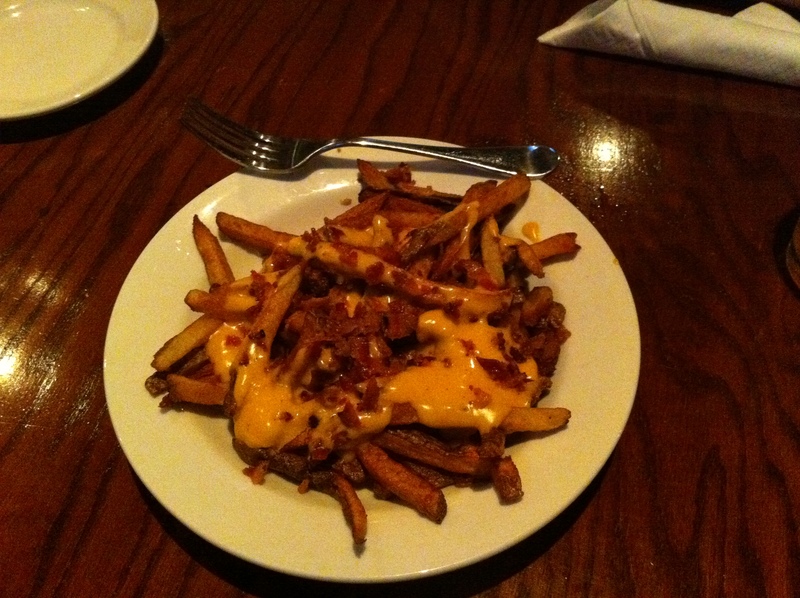 Angus: After settling in and ordering an appetizer (bacon cheese fries), we began to wonder why Brazwell’s calls itself a “premium” pub. Our first guess would be that the premium status would be reflected in their beer selection. That didn’t really turn out to be the case. They had a very safe selection—the big three, along with Fat Tire, Sweetwater 420, and Guinness. Maybe they had premium bottles, but as we’ve seen at other places, there was no beer list. So, we ordered some Blue Moons and hoped that they would make up for that with some premium food. Hereford: But, then the bacon cheese fries came out. For $6, we got a relatively small plate of fries which were very greasy. Angus: Still, we ate them all. They used nacho cheese, which I like, instead of the ground cheddar, and the bacon was pretty good. But the fries seemed, honestly, kind of gross. If it was for the nacho cheese, we probably wouldn’t have finished them at all, even though the portion size was small for an appetizer. Hereford: We found out after talking with our server that Brazwell’s has been here for about a year, and that they replaced the Press Box which was previously in this location. We were also told that they are owned by the same people who own the Whiskey Warehouse , but that they are operated independently—they have different chefs and get their ingredients from different places. Hereford: It came time to order our food, and Angus got the Western burger. He always gets the bacon cheeseburger, and this was the closest match. The Western burger is described as a “barbecue burger” with bacon, cheddar cheese, and fried onions. I, as I always do, asked our waitress what burger sets them apart at Brazwell’s. Unfortunately, she didn’t have any suggestions herself, so she went to the kitchen and asked the chef, who didn’t have an opinion about it either. I should have been worried at that point. If the server says, “Well, they’re all pretty good,” it usually means none of them stand out or are very interesting. But, I tried to put that worry out of my mind, and I asked for the Matheny burger, which came with Swiss cheese, grilled bell peppers, caramelized onions, and sautéed mushrooms. I asked what the Matheny was named after, because that’s a fairly strange name for a burger, was told it was named after a customer who would come in frequently and asked for a burger specially made for him in that style. Eventually they put it on the menu and named it after him. Angus: We thought that was pretty awesome. I would love to have a burger named after me somewhere— you know, my real name. An Angus specialty burger would probably end in confusion. Hereford: After about 20 minutes from ordering, our burgers came out. Angus: Every burger, in addition to their special ingredients, comes with tomato, lettuce, onion and pickle (despite the fact that the menu only tells you it comes with lettuce and tomato). So, I slid off my tomato, onion, and pickle, and bit into the burger. The burger was good, but I felt the ingredients had more impact and flavor than the actual burger. The meat itself seemed plain—there was no seasoning, and it didn’t seem very juicy. I wonder if it had been frozen for longer than it should have. 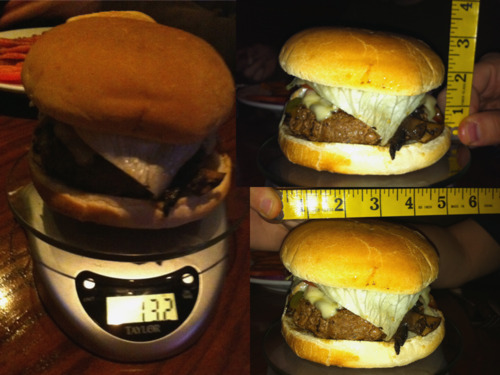 It was substantial in size—you get a lot for what you paid for, but that hardly makes up for flavor. 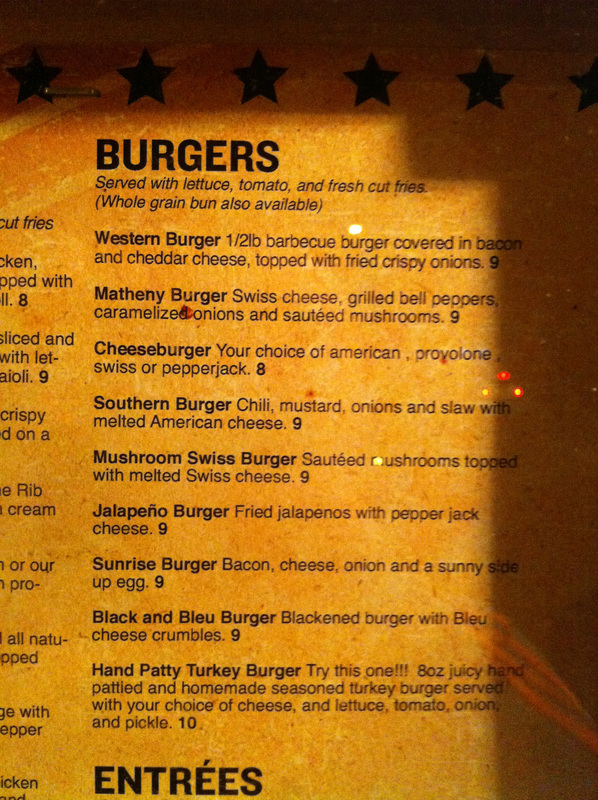 Also, on the menu it says I should have a “barbecue burger,” which made me think it would have barbecue sauce. I didn’t notice any when I ate it, and I thought that was strange. I wonder what else “barbecue burger” could mean. The onion rings on there were good—although they could have been crunchier. Onion rings aren’t a side item, but they probably should be. They were definitely better than the fries. The fries we got were just as greasy as the appetizer we ordered, and without the nacho cheese and bacon, they were basically inedible. Hereford: I thought this was the type of burger that is hard to review. I mean, I pretty much liked my burger—everything that was on it was pretty good. But, I agree with Angus, the toppings were great, but the burger itself was mundane. 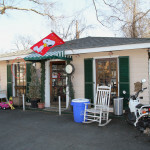 Not bad—I would eat there again—just mundane. It was the type of food that is hard to have an opinion about, good or bad. 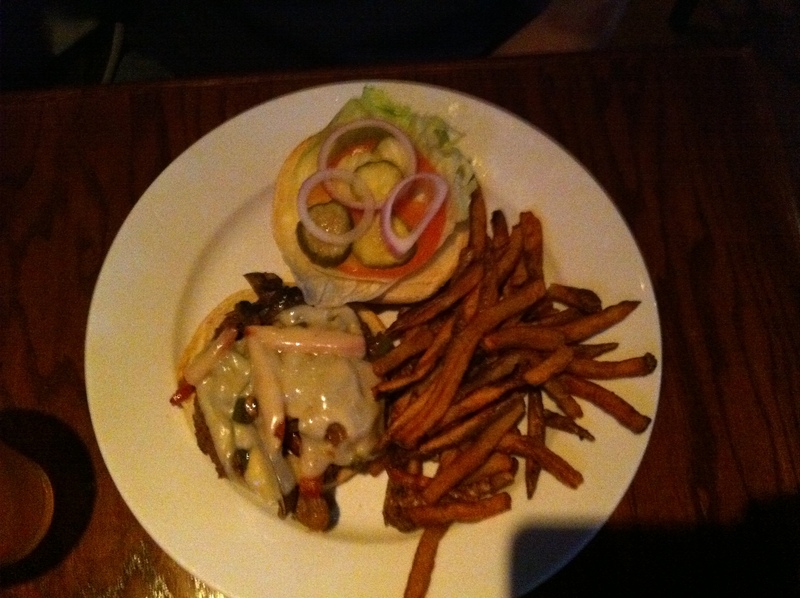 The flavor of my burger was dominated by the peppers and the cheese, both of which were great. I love green peppers, and I think it’s a great topping on burgers. As such, it is often underused. And there was plenty of cheese, and it was flavorful. But, I couldn’t really taste the mushrooms. And the onions were cut so thin that they kept slipping off. I wish I had noticed before I ordered that a whole wheat bun was available, because I would have liked to try that. I agree with Angus about the fries. 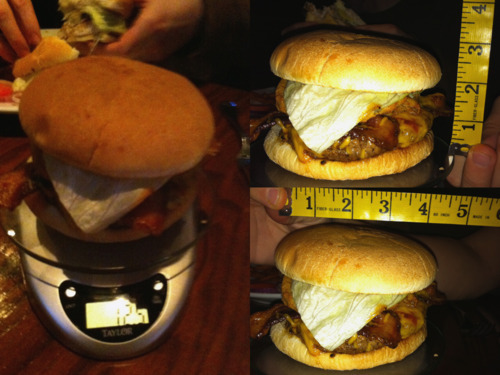 Over 90% of the fries that came out with the burger remained on the plate when they took it back. They were awful. Food: 3.25 — Our food was slightly above average overall, but also wildly inconsistent. The fries were terrible and their meat was fairly bland. But keep the ingredients were great, and we wouldn’t mind eating here again. But they have room for improvement. Service: 4 — Our server was very nice, and food came out relatively fast, considering we also had an appetizer. 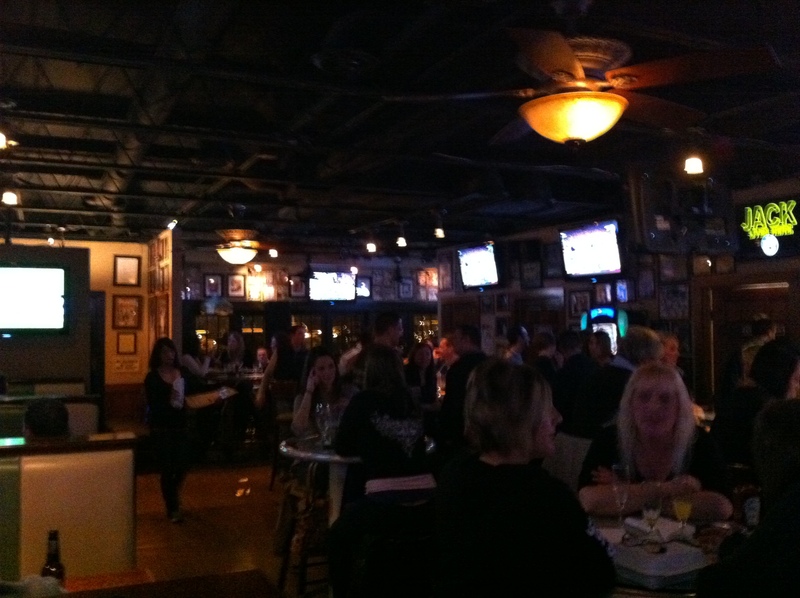 Theme: 3.25—This is definitely a sports bar, and they had a lot of sports stuff up. They have a wide range of different sports on TV. But it didn’t seem very unique or surprising. 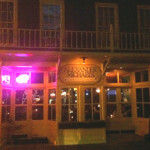 Atmosphere: 4— We thought Brazwell’s seems like a fun place to hang out. 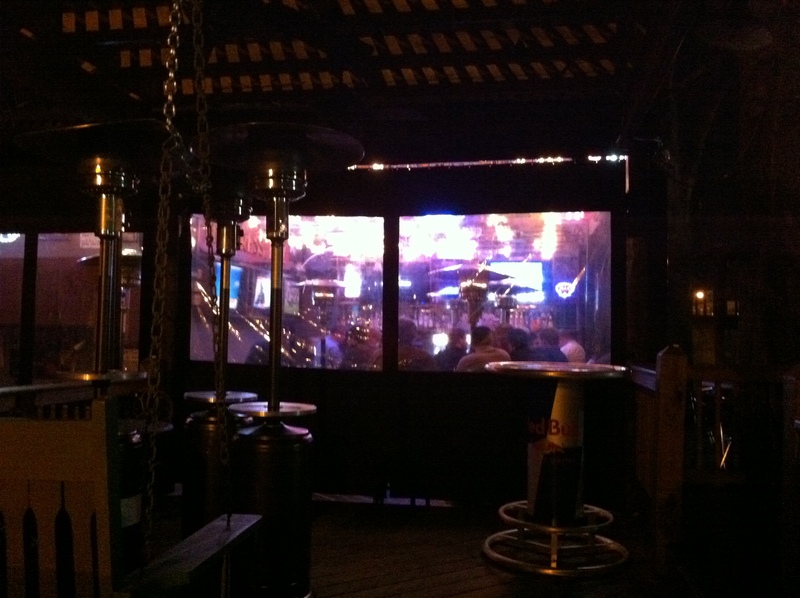 The outdoors patio really helps with that—on a summer night it would be fun to go have a drink and sit out there. Beer Selection: 2.5— They had Fat Tire, they had Sweetwater, but otherwise it was all the normal beer you find anywhere else. They didn’t have a list, so we don’t know what they had in bottles. This was a big disappointment for us. 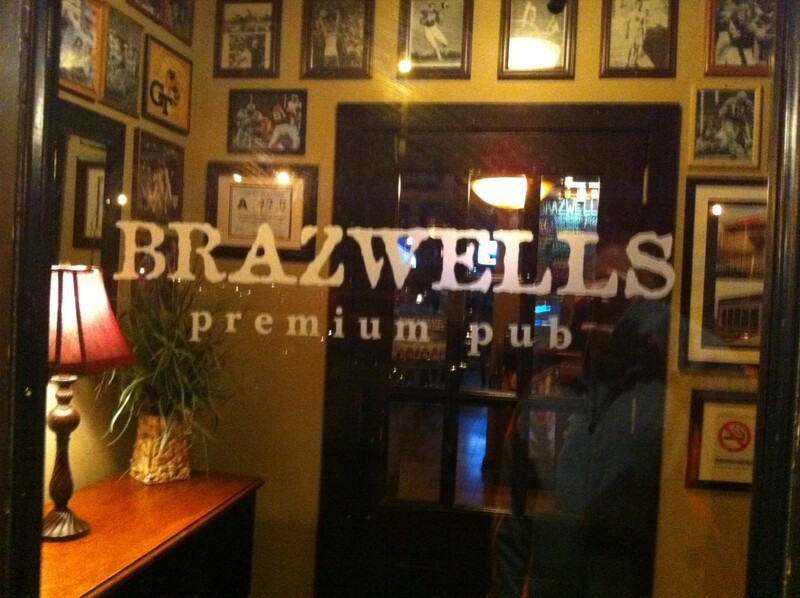 Angus: So, if you find yourself as we did on Montford needing a place to eat a burger and drink a beer, you could certainly do worse than Brazwell’s Premium Pub. But, in regards to food quality and beer selection, we suspect that you might be able to do better. Hereford: In other words, they’re not exactly premium. 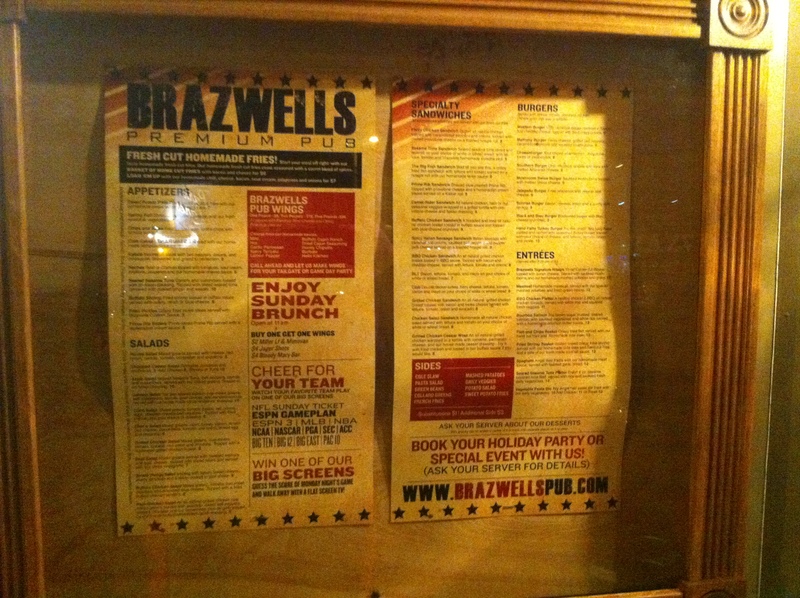 Maybe they should call it Brazwell’s Fairly-Decent-But-Not-Overwhelmingly-Nice Pub. Angus: I don’t think that would fit on a business card.